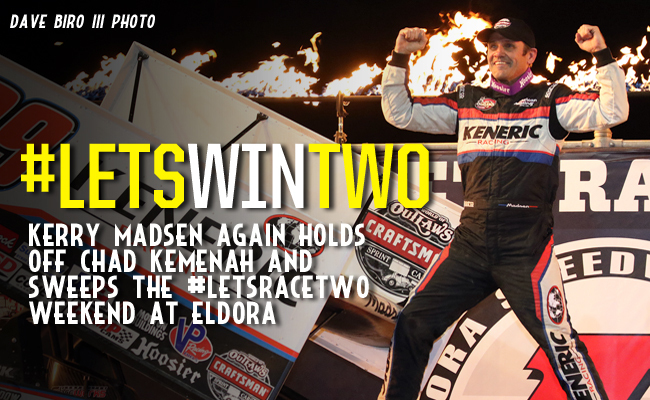 ROSSBURG, Ohio - May 7, 2016 - It was déjà vu at Eldora Speedway Saturday night, as Friday's battle between Kerry Madsen and Chad Kemenah seemed to play out again in front of a large crowd at the #LetsRaceTwo finale. After a pitched battle through the middle and late portions of the feature between the former Outlaw regular Madsen and All Star Circuit of Champions driver Kemenah, Madsen claimed his second World of Outlaws Craftsman® Sprint Car Series victory of the season and the weekend sweep. "We've been quick all year and we just haven't showcased it. The guys just stepped it up - the car was a rocket ship all weekend," Madsen said. "Just to get this up here the last two nights is fantastic. It was a hell of a race." Madsen battled from fourth in the Dash to share the front row with Daryn Pittman for the feature. As the green flag fell on the 30-lap main event the two drivers engaged in a multi-lap back and forth. By lap two, Madsen was able to get breathing room from Pittman and pull away. As Madsen began to run down traffic, the battles heated up behind him. Joey Saldana worked for a line around David Gravel for fourth. As the field worked it's way around, Saldana threw a slider in turns three and four. As he drifted off the turn at the exit of four, contact was made between he and Gravel that sent Saldana tumbling. The crash ended Saldana's night. When the race returned to green, Gravel continued to have his hands full. Donny Schatz worked the track for the right line around but was not able to close the deal. The driver on the move though was Kemenah, himself a former Outlaws regular, who started the feature in 11th. By lap 12, as Madsen began working his way through traffic, Kemenah found the bottom and began passing cars. He got around Gravel for fourth off of turn two, then around Jason Johnson for third, and then again, on the bottom of turn four, he got around Pittman. With just Madsen separating him from the win, Kemenah charged ahead. By lap 20 Kemenah had closed the gap to a second and a half. By the next lap he was on Madsen's bumper. And by lap 22, Madsen was fighting for the lead. "I didn't know who it was but I knew he was there so I stepped it up and nearly junked the thing in two," Madsen said. "I thought, I better not do that again. I definitely upped the tempo when I saw him and I knew if there was one hiccup, the line he was running, he would drive right by me. It was intense." Kemenah gave it one more shot on lap 24, getting side-by-side with Madsen, but Madsen pulled away and scored the weekend sweep. "I could hit right through the middle of the race track, I don't know why," said Kemenah, who finished second for the second night in a row. "I could go wherever I needed to go. I probably showed (Madsen) my nose there too soon there with Kerry and he knew I was there. Hats off to them guys, they did a really good job both nights. When you start up there, you need to capitalize and I did." Pittman maintained his third place finish through the remainder of the feature with a tough battle ongoing through much of the night behind him. "Luckily, I was in third the whole time and didn't see what was happening behind me. I could hear them and somebody would show me their nose every once in a while so I figured it was getting pretty heated. "We had a good weekend. Our car is close. We're just a little off. Kerry and Chad both were kind of in a class their own this weekend." Joining the drivers with weekend sweeps was Saldana who was fast qualifier both nights at Eldora. He is now the leading fast qualifier on the season with a total of five. The World of Outlaws Craftsman® Sprint Car Series returns to action on Friday, May 13 as the series makes its first ever appearance at Plymouth (Ind.) Speedway. For more information and to learn how to purchase tickets, visit WoOSprint.com/Plymouth-Speedway. RACE NOTES: Kerry Madsen and Donny Schatz are the only two drivers this season to sweep a double-header event. Schatz did it at Stockton… Prior to Friday night, Madsen was winless since since August 2015… Joey Saldana was again the night's fast qualifier with a lap of 13.160. He is the season's leading qualifier. CONTINGENCY WINNERS - MSD Ignitions ($25 cash): Joey Saldana; MSD Ignitions ($50 cash): Kerry Madsen; Penske Shocks ($50 cash): Chad Kemenah; JE Pistons ($50 cash): Shane Stewart; VP Racing Fuels ($50 cash): Brad Sweet; Edelbrock ($50 cash): Brad Sweet; Comp Cams ($50 cash): Greg Wilson; Morton Buildings ($50 cash): Tim Shaffer; Cometic Gasket ($50 cash): Brady Bacon; Super Flow ($50 cash): Jason Sides; Craftsman/Sears ($100 cash): Kerry Madsen;KSE Racing Products ($100 product certificate): Chad Kemenah; Comp Cams ($50 product certificate): Kerry Madsen; JE Pistons (Set of Rings): Jason Sides; JE Pistons (Set of Rings): Joey Saldana. SEASON WINNERS: Donny Schatz - 5 (Volusia Speedway Park on Feb. 14, The Dirt Track at Las Vegas on March 4, Stockton Dirt Track on March 18, Stockton Dirt Track on March 19, Silver Dollar Speedway on April 2); Brad Sweet - 5 (Volusia Speedway Park on Feb. 13, Volusia Speedway Park on Feb. 14, Cotton Bowl Speedway on Feb. 26, Ocean Speedway on April 1, Bakersfield Speedway on April 15); Daryn Pittman - 3 (Royal Purple Raceway on Feb. 27, Perris Auto Speedway on April 16, USA Raceway on April 18); Joey Saldana - 3 (The Dirt Track at Las Vegas on March 3, Devil's Bowl Speedway on April 22, Jacksonville Speedway on May 4);Kerry Madsen - 2 (Eldora Speedway on May 6, Eldora Speedway on May 7); Shane Stewart - 2 (Arizona Speedway on March 6, Devil's Bowl Speedway on April 23); David Gravel - 1 (Thunderbowl Raceway on March 12); Jason Johnson - 1 (Placerville Speedway on March 24); Jason Sides - 1 (I-30 Speedway on April 26). World of Outlaws Craftsman® Sprint Car Series Statistical Report; Eldora Speedway; Rossburg, Ohio; May 7, 2016. A-Main - (30 Laps) - 1. 29-Kerry Madsen  [$10,000]; 2. 10H-Chad Kemenah  [$5,000]; 3. 9-Daryn Pittman  [$3,000]; 4. 5-David Gravel  [$2,700]; 5. 2-Shane Stewart  [$2,500]; 6. 41-Jason Johnson  [$2,200]; 7. 15-Donny Schatz  [$2,000]; 8. 11K-Kraig Kinser  [$1,800]; 9. 49-Brad Sweet  [$1,600]; 10. W20-Greg Wilson  [$1,450]; 11. 49X-Tim Shaffer  [$1,300]; 12. 17W-Bryan Clauson  [$1,200]; 13. 19M-Brent Marks  [$1,100]; 14. 99-Brady Bacon  [$1,000]; 15. 7S-Jason Sides  [$950]; 16. 71-Jamie Veal  [$900]; 17. 7-Paul McMahan  [$850]; 18. 1S-Logan Schuchart  [$750]; 19. 23-Trey Starks  [$725]; 20. 1-Sammy Swindell  [$700]; 21. 70-Danny Holtgraver  [$700]; 22. 93-Sheldon Haudenschild  [$700]; 23. 19-Paige Polyak  [$700]; 24. 83-Joey Saldana  [$700]. Lap Leaders: Kerry Madsen 1-30.